If your grandmother is an authentically good cook, you don’t need this book! You need to go spend some time with her in the kitchen, learning how to create your favorite dishes. Surely you know that her perfect lasagna, heartwarming beef stroganoff, and famous oatmeal raisin cookies are more than just recipes? Most of what makes her cooking special is the technique, the carefully chosen ingredients, the things her recipe cards don’t say. So, go watch her do her magic. Help her. Pick her brains. Learn from the best. What if you aren’t so lucky? What if your grandmother has already passed on? Or, scarier yet, what if her idea of cooking is warming up a TV dinner and opening a bottle of beer? That’s where How To Cook Like Your Grandmother comes in. It’s more than just recipes. It’s like having a Grandma in the kitchen with you. Oh, sure, we’re all in search of the perfect recipes – the ones that are so easy they seem to cook themselves. Don’t forget about what made Grandma’s cooking so special – Grandma herself. She knew how to cook. And, after reading through How To Cook Like Your Grandmother, so will you! I learned everything I know about cooking from my Grandparents and my mom. They were a huge influence on what has become my cooking philosophy and style. So I love this blog because it gives a shout out to The Grandmothers of all cultures and walks of life. It is about respecting the older generation and what they taught us. How To Cook Like Your Grandmother puts the missing steps and the missing ingredients back in, and ties it all together with step-by-step instructions that get you through the first time. BUY IT FOR ONLY $19.95 and you’ll learn more than a few recipes: You’ll learn how to cook. Even you can master good old-fashioned, from-scratch cooking. Surveys always show that women rank “sense of humor” as one of the top qualities they look for in a man. You would see “good cook” high on those surveys, except women don’t think there are enough men who cook to bother looking! How To Cook Like Your Grandmother won’t get her over for dinner. But it can help you keep her coming back for more. WARNING! Don’t cook for her until you know she’s “the one.” Once you make her a fabulous fettuccine alfredo or lasagna from scratch, and make it look easy, she’ll never let you go. ORDER NOW and see how little effort it takes to make a really big impression. The Thanksgiving turkey, with crispy golden skin over moist, delicious white meat. Who doesn’t love the amazing fragrance of a freshly cooked turkey? And what about The Day After, when she’d whip together an unforgettable turkey noodle soup made with fresh egg noodles? The comforting Sunday family dinner of lasagna made from scratch with home-made pasta and herbs from the garden. Traditional Irish Soda Bread, with golden raisins and topped with raw sugar, served warm from the oven with freshly-churned butter. Did I just say freshly-churned butter? Yes, I did. But, don’t be intimidated. It’s actually easy to make and oh-so-yummy. Whatever is on the menu, you can bet it won’t come out of a box. This grandma cooks from scratch. Claim your ticket to unforgettable, stress-free entertaining. Have you ever wondered how grandmothers managed to feed a small army of cousins without breaking a sweat? How absolutely every single dish is the most extraordinary thing you’ve ever put into your mouth? Other cookbooks are all about recipes and how to get them right. 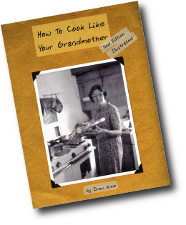 How To Cook Like Your Grandmother is all about cooking and how to get dinner right. Drew’s style is lighthearted and very down to earth with no-holds barred … For foodies and others who appreciate originality in cookbook design, I recommend How to Cook Like Your Grandmother. The recipes are straightforward and easy to prepare … I know you will enjoy this gem of a culinary’s viewpoint on the foods we prepare in our everyday lives. It’s a how-to manual for your kitchen. The simple ingredients and straightforward preparation let you modify these recipes and create your own “signature” dishes. CLICK HERE TO ORDER NOW and start cooking like your grandmother in less than two weeks. Want to know THE secret to making good food? It’s not just about techniques or recipes. It’s about ingredients: simple, wholesome, real ingredients. Has this ever happened to you? You’ve got a recipe that calls for something straightforward, like bread crumbs. You take the can down from the cupboard, and as you’re measuring it out you notice the ingredients list. Holy cow, half that stuff doesn’t even sound like food! I know, I’ve been there. And I decided if I was going to take the time to cook, I was going to cook real food. Not just heat up stuff from a box — a box you can’t read without a chemistry degree. I didn’t realize how far we had gotten from real food until I met an 11-year-old who didn’t recognize chicken. She looked at a drumstick and asked, “What’s that?” She had never seen chicken that wasn’t in the shape of a nugget. Real Food doesn’t come from a box, doesn’t come with labels making health claims, and it isn’t manufactured by food scientists. Too many cookbooks are all about what not to eat. Usually the best you can say about those dishes is that they’re okay … for diet food. How To Cook Like Your Grandmother is about taste first, last and always. There are no substitutions based on calories. Grandma didn’t count calories when she made pecan pie, why should you? If you’re looking for the best tasting recipes, this is where you’ll find them. If you’re looking for recipes that fit the diet of the week … well, you can’t please everybody. and start eating what you want to eat, not what the latest fad says you should eat. Why should you believe those labels anyway? Who can trust the latest food scare of the week? First cholesterol was going to kill us. Now eggs are the ideal food. Remember when we all switched from butter to margarine because of the saturated fat? But then we found out the trans fat in margarine is several times worse. Oops. Our grandmothers didn’t have prefab meals, or the food police telling them what they weren’t supposed to be eating this week. What they did have were recipes that had been handed down from mother to daughter, for generations. These were often the same recipes made with the same ingredients that people had been using for centuries. It’s never been easier to take control of what you eat! In How To Cook Like Your Grandmother there are no prepared foods. If there are five ingredients listed for a recipe, that’s what is in the dish: five ingredients. You won’t have to read the fine print on the back of a box to tell what you’re eating. If you want to save time with prepared foods, it should be because you want to, not because you think you can’t make it yourself. Oh, and did I mention that each of these will be better than anything in a bottle at your local grocery store? Never be afraid of the kitchen again. But I’ve never been able to cook … What if I mess up? … What if I don’t have the right tools? … How do I know what fresh peaches should look like? Whoa, slow down a little! First, let’s get this out of the way: If you can drive a car, you can cook. Would you try to take driving lessons from an Indy car racer? Of course not. So why do you think you can learn to cook by watching a French pastry chef on the Food Network? If you’ve got a couple of pots and pans, one good knife, and a willingness to follow directions, you’ll be cooking like a grandma on day one. Well … you really should buy a meat thermometer first. You can predict about how long it should take to cook a hunk of meat, but you need to actually check it to know. See? That’s the kind of tips you’ll find in How To Cook Like Your Grandmother. Because that’s what Grandma would be telling you if she were teaching you this stuff herself. The printed version is in black and white. I could claim I’m “harking back to the kind of cookbooks your grandmother used to use.” But that wouldn’t be true. The fact is, this book would have to cost four times as much to print it in color. What you get instead is a spiral-bound book that you can lay flat on the counter while you’re cooking. You’re supposed to use it, not just look at it. Sure, I like when people say my food looks good. I like it better when they say it tastes good. So … more recipes, no color.